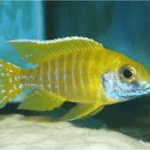 Feeding: Carnivorous – prefers live foods such as blood worms, snails or brine shrimp, but will generally accept frozen, flake or pellet foods. 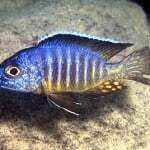 Breeding: Peacock Cichlids are ovophile mouthbrooders that form a matriarch family. 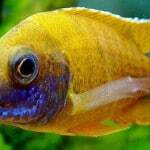 The pair should be conditioned separately on mosquito larvae, bloodworms, and crustaceans. 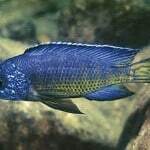 The water should have a pH from 8.0-8.2, a water hardness 10-18 dH, and a warmer temperature of 79-84°F (26-29°C). 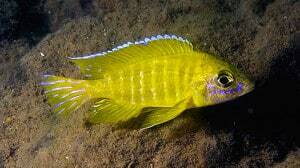 The female spawns a small number of eggs on the rocky bottom. These are fertilized by way of the dummy-egg method. The young should be raised on newly hatched Artemia and fine-grade flake foods. 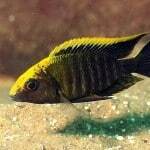 Additional Information: Strong yellow colouration sets the Aulonocara sp. 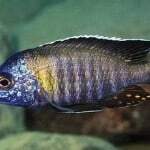 Stuartgranti Maleri aside from many other Lake Malawi cichlids. 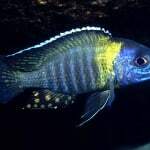 This entry was posted in Profiles Tropical All Fish, Profiles Tropical Lake Malawi Cichlids.